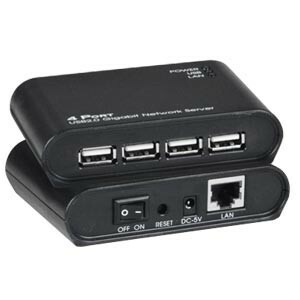 Connect and share four USB 2.0 peripheral devices over a Gigabit network. Supports up to 63 USB Over IP Extenders on the same subnet – connect up to 252 USB devices. Also known as: Remote Access to USB Devices, USB on IP, USB IP Extender, USB Management over IP. The XTENDEX® USB Over IP Extender allows Windows PCs to connect to four USB devices on the same subnet, eliminating the need for locally-attached host PCs. USB peripheral devices can be centrally managed and monitored from a remote server or PC via the web interface. USB-IP-4LC supports USB devices such as USB hard drives, USB flash drives, USB card readers, USB webcams, USB scanners, USB to serial converters, USB multi-function printers (MFP), or other USB devices to be shared on a network. Extends USB cabling distance to 330 feet (100 meters). Extend past 330 feet (100 meters) by connecting multiple hubs/switches within the same subnet. Transfer data over a 1000Base-T Gigabit Network. Will not communicate to another subnet. Creates systems redundancy and increases security since host PC can be placed in a remote location. Access and monitor devices over a TCP/IP connection. Simplifies operations and reduces IT support. Acquires IP address via DHCP when plugged in to a network. IP address can be changed. Once a static IP address is assigned, it can be directly connected to the LAN port of a PC - no crossover cable required. Compatible with bulk or interrupt type USB devices. Bar-code scanners, USB keyboards, CAC readers, USB to serial converters, Canon T5 cameras, printers, fingerprint scanners, mice, pole displays, card readers, flash drives, external hard drives, etc. Does not support audio devices (isochronous data transfer). Supports data rates up to 480 Mbps per USB port. Compatible with PCs or laptops with Windows XP/Vista/7/8/10. Supports 32- and 64-bit operating systems. Not compatible with MAC OS. Only one remote PC can be connected to each USB device at a time. Supports up to 63 USB Over IP Extenders on the same subnet – connect up to 252 USB devices. 330 feet (100 meters) over CAT5/5e/6 cable. Use CAT5/5e/6 cables to connect the unit to a network switch up to 330 feet (100 meters) away. Operating relative humidity: 0 to 80% non-condensing RH. Storage relative humidity: 0 to 50% non-condensing RH. 100 to 240 VAC at 50 or 60 Hz via AC adapter (country-specific power adapter included). WxDxH in: 3.75x2.68x0.92 (95x68x23 mm). 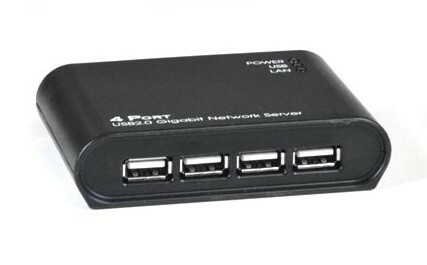 Connect and share four USB 2.0 peripheral devices over a Gigabit network. Up to 63 USB-IP-4LC units can be supported on the same subnet, allowing up to 252 USB devices to be connected.